This is a special plant. I love this. There is no specific place for this plant to grow. It’s anywhere and everywhere. I have this attraction towards this plant which made me blog about it. I remember when I was a kid. (I do remember somethings) . Me and my friends use to kick these plants and they used to close as usual. The instant closing was the part of attraction. Later realizing that it just needs a touch. Nothing more. So saved some energy by just touching it instead of kicking. The “Who closes more? ?” competitions. This used to happen while going to school. And while coming back the plants revert back to original. Only to be closed by us again. The goats in area also loved this plant. It was their favorite food. Now the things are different. This little plant has disappeared from roads. And I hardly see any kid attracted towards this plant if at all they find one. This plant also posses a beautiful flower. It’s soft and pink in color. Though odorless the flower suits the plant and makes it complete. Today after so many years I saw this plant. A smile on my face and I bent down to touch it. Just refreshed my old memories. It is still a shy plant. Glad to see one of the thing that will remain as is forever. What an interesting plant. I may have seen one before but I did not know that it closes when touched. I’ll probably be looking for this type of plant in my area, do you know what kinds of areas they are prone to grow in? I love those plants. they dont have them so much here in austin, but there are alot of them in houston where i grew up. i think they like warm moist areas. i always see them down in the grass. I don’t think I have ever seen them. They look pretty interesting though and I love the story. In the Philippines, that plant is called “Makahiya”. How about a poem on this?? I used to LOVE those plants. We would waste our days laying in the grass touching them over and over. I haven’t seen one years. Is this species getting extinct?? This is very common plant and it should be everywhere. I’ll send you some if you want. I’ve never seen one of those before…now I want to! 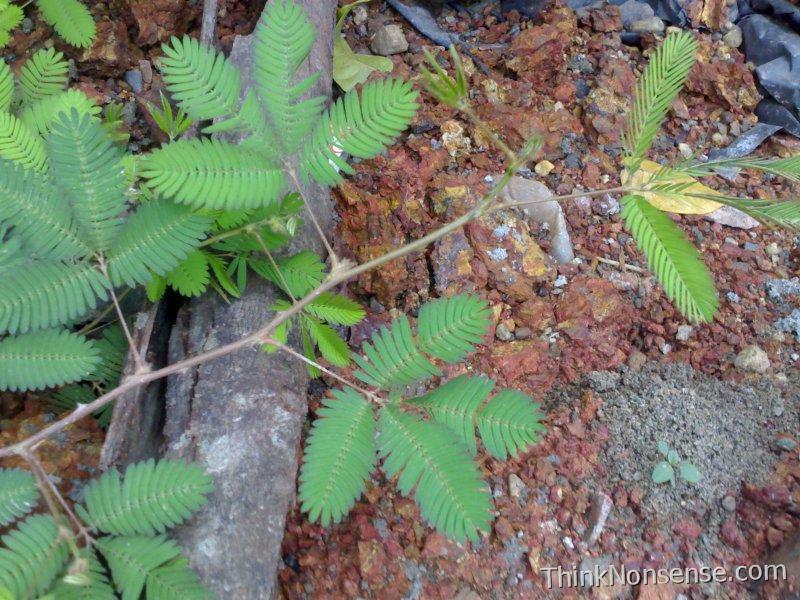 Common name for this plant is “Sensitive plant” or “Shy plant”. In Malaysia, it is called “Semalu”. Thats perfect picture. I was looking for such a picture. Now it completes my post.